If you thought beignets could only be enjoyed in New Orleans, it's time to change your thinking. This recipe for buttermilk beignets will allow you to make a batch of fluffy, powdered sugar-covered pillows of goodness in your own home. And if that wasn't enough, the salted caramel dipping sauce we've created to go with them? Well, that will knock your socks off. Guaranteed. The next time you're in the mood for a real sweet treat, try these buttermilk beignets with salted caramel dipping sauce. 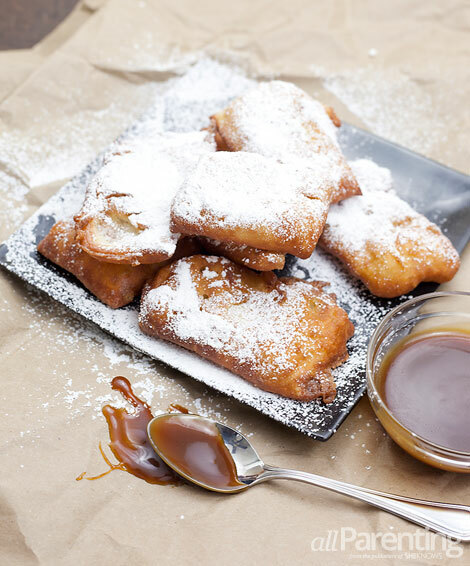 Before making both, you'll want to make sure you have a thermometer on hand as well as some patience (especially with the beignets). Other than that, have fun in the kitchen and enjoy. Pour milk into a small saucepan over medium heat and heat to 130 to 135 degrees F. Remove the milk from heat, add the buttermilk and pour into the bowl of a stand mixer. Add the sugar and yeast to the milk and gently whisk. Let sit for 5 minutes so the yeast can activate. The mixture will be foamy on top when the yeast is activated. Add the flour, baking soda and salt to the wet ingredients and mix on low speed using a dough hook until the dry ingredients are moistened, about 1 minute. Increase the speed to medium and continue mixing until the dough forms a ball, about 4 minutes. The dough should be wet and sticky. Cover the bowl with plastic wrap and a kitchen towel and let the dough rest in a warm spot for 1 hour. When you're ready to fry the buttermilk beignets, pour 2 to 3 inches of peanut oil into a cast iron skillet or other heavy large pot. Heat to a temperature of 375 degrees F.
While the oil is heating, generously flour your work station. Remove the dough from the bowl and place on the floured work station. Sprinkle the top of the dough with flour, gently press it down to flatten, fold in half and then in half again. Sprinkle flour on top of the dough again and roll the dough out with a floured rolling pin to about 1/2-inch thick. Let the dough rest for 1 minute before cutting it into 1-1/2 to 2-inch squares. If possible, move the squares apart on your work surface so they don't stick together after cutting. Carefully add the beignets to the hot oil, 3 or 4 at a time. Fry until golden brown in color on both sides, flipping as needed. Using a slotted spoon or tongs, carefully remove the beignets from the oil and set on paper towels to drain any remaining oil for a few seconds. Transfer to a serving plate, dust generously with powdered sugar and serve while they are still hot. Before adding more beignets to the fryer, make sure that the temperature is back up to 375 degrees F.
These buttermilk beignets are best served fresh and hot from the fryer (leftovers get cold and chewy). If you don't want to make all of the beignets at once, the cut dough squares can be saved for frying the next day. To do this, line a baking pan with parchment paper and grease with cooking spray. Place the cut dough squares on the greased parchment paper, about 1 inch apart and place another greased piece of parchment on top, greased side down. Wrap the baking sheet with plastic wrap and refrigerate. Follow steps 7 and 8 to fry them directly from the refrigerator when ready. Before starting the caramel, cut butter into 1/2-inch pieces and measure out the heavy cream and sea salt. Add the sugar to a medium saucepan and heat over medium-high heat. When the sugar starts to melt, start whisking it. Continue whisking the sugar as it heats until it is completely melted. It will clump during this stage which is OK, just keep whisking. Once the sugar has melted, stop whisking and let it heat to a temperature of 350 degrees F.
Carefully add the butter and whisk until it is melted. The butter will foam in the pan so be careful and keep stirring, switching to a spoon if needed. Remove the pan from the heat and slowly pour in the heavy cream. Whisk until the cream is fully mixed in and the caramel is smooth. Add the flaky sea salt (or fleur de sel) and stir. Let the caramel sit for 10 to 15 minutes in the pan to cool. Pour into a large jar and continue to cool to room temperature. Store the salted caramel sauce in the refrigerator until ready to use for dipping your beignets. Also try it drizzled over brownies, ice cream or any other treat you can think of.